Born 21 November 1903 in Westhoughton, Lancashire [registered in Bolton, December 1903]. Baptised 20 December 1903 in St Bartholomew Church, Westhoughton. According to the 1911 census, the seven year-old John was the second eldest of five children to John Thomas and Hannah (née Ashcroft), living at 8 Common Street in Westhoughton. His father is a coal mine hewer. Cannot be found on the 1939 register. Height/Weight 5' 8", 10st. . 5' 8½", 10st. 6lbs . Club(s) Started playing football in the Westhoughton Sunday School League and also with Hindley Green FC of the Lancashire Alliance. He also signed amateur forms with Wigan Borough FC at this time. Joined Horwich RMI FC in 1924-25. 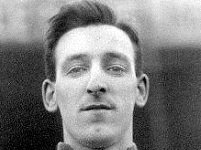 Burnley FC then paid £125 to sign him on 14 March 1925, following a succesful trial against Newcastle United FC. He made 167 league appearances, scoring 42 goals. Blackburn Rovers FC then spent £6500 to take him on 5 December 1929. He made another 324 league appearances, scoring 108 goals. He retired from playing during WW2. Club(s) After WW2 ended, Bruton remained with Blackburn, becoming the club's assistant secretary. On 10 December 1947, he stepped into the manager's shoes, a position he held until his resignation on 10 May 1949. On 14 March 1950, he then became the manager at Bournemouth & Boscombe Athletic FC until March 1956. Player number One of six who became 528th players (531) to appear for England. First match No. 160, 17 May 1928, France 1 England 5, an end-of-season tour match at Stade Olympique Yves-du-Manoir, Colombes, Paris, aged 24 years 178 days. Last match No. 164, 13 April 1929, Scotland 1 England 0, a British Championship match at Hampden Park, Mount Florida, Glasgow, aged 24 years 143 days. Jack worked as a miner prior to taking up the game professionally and for a lamp company after leaving Bournemouth. He did return to the game in 1961 as a scout for Blackburn Rovers FC, subsequently having scouting spells with Bournemouth & Boscombe Athletic FC and Portsmouth FC. - An English Football Internationalists' Who's Who. Douglas Lamming (1990). Hatton Press, p.51.